This caja lambe-lambe show has designs by Marcos Leal and was made by Brazilian puppeteers, if I’m reading the YouTube description correctly. I like the neon colors and the way it gets so much story out of very simple objects. I also think the movement really works with the ragtime soundtrack! There are a couple similar versions of this show online, this one is by Rogério Pett. It includes one aspect of lambe-lambe that always fascinates me, which is how the puppeteer comes up with a costume for their hands, to better incorporate them into the scenario. It can be distracting, so it’s definitely a delicate balance, but it’s always interesting to see. This video by Leonel Arregui, is probably my favorite of the three. It definitely has the most complicated design, and takes full advantage of the 2-D puppet form. The movement of the set and characters almost reminds me of Japanese theater such as dogugaeshi, with its many sliding screens. See #1. Photo from The Independent. 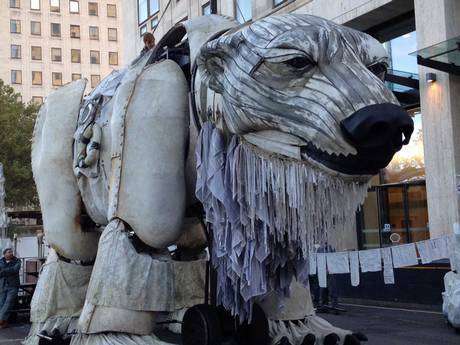 A huge animatronic bear appeared on the streets of London this summer to protest drilling in the Arctic. The otherworldly sculpture of our favorite artist Shaun Tan will seen be on view in this new book. If only we were going to Australia sometime soon! In a perfect world, we would collaborate with artist Jonathan Latiano to make some puppet dolphins, along the same line as this exhibit. Fair warning, this video short from France about shadow puppet artist and animation pioneer Lotte Reiniger is profoundly moving and may make you cry. You can read more about Reiniger’s life and work on our blog. This video contains some of the various pieces of the process it took to create Saudade: building shadow puppets, experimenting with movement on the various screens and finally the moving crankie and puppets in the finished piece. We hope you enjoy it! We occasionally get questions about how we create our shadow puppets for shows like Saudade, so here is a short video with the steps for making a joint out of fishing line. Genna Davidson explains the process, using a lighter, awl and scissors. Hopefully this will be useful to those of you making puppets at home! 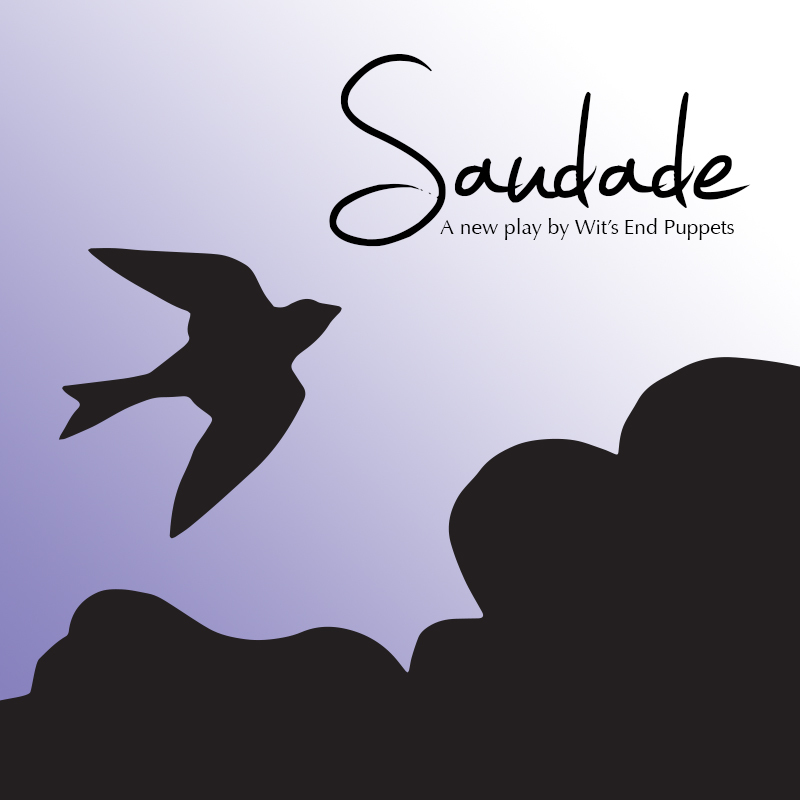 The puppets for Saudade are designed by Katherine Fahey, a Baltimore-based artist and puppeteer. They are cut from poster board and pieces are connected with fishing line joints and operated with either wooden or metal rods. In this short video, I’m creating a puppet of a teacher character. It’s a process that takes a lot of time, patience and precision with an X-acto knife. Rehearsal puppet put together and strung on a control! 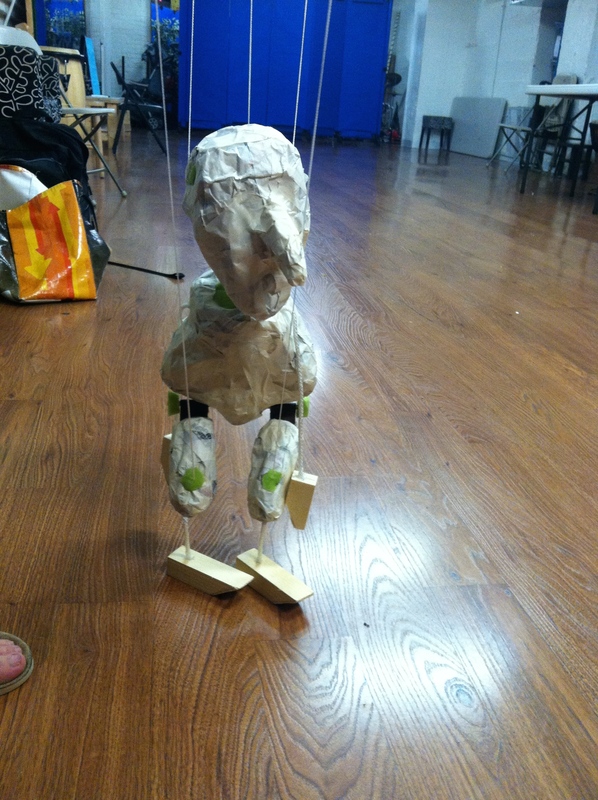 I created this rehearsal puppet for Malevolent Creatures about a month ago, with no idea that he would become such a fun tool for improvisation. Throughout our rehearsals, whenever there was a break, someone would pick him up, give him a funny voice and start a conversation. Eventually we decided that (outside of the world of the play) he was French. And since the World Cup is in full swing, it was inevitable that the puppet would get pulled into our many arguments about who was going to win the day’s games. Clearly, puppets love football just as much as people. 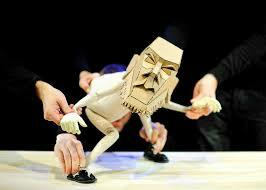 Here is a short video of our puppet explaining his views, as performed by Elizabeth Dapo. 1. Last week, Pat and I got to see a fantastic show by Blind Summit Theatre from England. It was called The Table and consisted of three puppeteers and one puppet telling the story of Moses, along with many clever asides. Really amazing work and the company website includes a set of tips for puppeteers which are also great. 2. A fascinating article about marionettes built by Ralph Kipniss, an artist I had never heard of before. While the Kickstarter campaign mentioned in the article did not reach its goal, there are still people working to raise the money to find a home for this amazing collection and preserve it for future generations. You can find out more and help out by donating here. 4. Last but not least, yesterday was Thanksgiving, which of course means the puppets that had the biggest audience were the Macy’s Parade balloons. Did you know that Tony Sarg, who first came up with the idea for those books, was a puppeteer? Here is a VERY short clip of him with one of his graceful marionettes. The balloons aren’t nearly so graceful, but they are a lot bigger.